You don't have to be Jewish (to wear Jewish jeans, a satire on the Calvin Klein bus ads). I'm in Israel, visiting with Rabbi Dr. Peter M. Rosenzweig, an esteemed colleague. Peter moved to the holyland a few years ago, but some of his patients, clergymen of other faiths, still meet with him on Skype for professional guidance. We're talking, and he asks, almost as an afterthought: "So what is the latest psychological Big Thing in America these days?" I'm a little flummoxed because I should know, but being there, being in Israel, and it isn't the jet lag, either, zaps me of anything work-related. Brain fuzz has set in. We're interrupted, thankfully, and only later, on the bus, on the way back to my sister-in-law's, do words like radical acceptance, acceptance commitment therapy, meditation, and mindfulness come to me. You might remember my hedging on mindfulness for everyone, maybe even as early as last year, because a patient came away from a workshop in serious distress. As therapists we pick up many pieces, and some of us learn by experience about vetting recommendations to types of treatment offered by non-professionals, people without mental health licensure. The workshop had been the patient's idea, and at the time, before his experience, everything meditation got the "like" emoticon from me. Even now, most books on the subject of mindfulness and meditation will, too. (See the review on Jaimal Yogis' All Our Waves Are Water). But not so fast on running off to a retreat, however. Burning Man, for sure, needs some serious research and reconsideration. But too late to talk about any or all of that, the moment has passed. I'm on the bus, and Peter is doing dishes with his wife, hopefully happy we barged in. He's a prolific writer, and as a beloved English teacher in the States for many years, his partner reads and edits, a labor of love. Years ago Dr. Rosenzweig wrote Married and Alone (no reflections) then, more recently, stayed with his rabbinic side, pulled together collections of his weekly Shabbat classes in the US, two volumes. What Did The Prophets Say (vol 1) is on Joshua, Judges, and Samuel I. What Did The Prophets Say (vol 2) explains Samuel II and Kings in psychological terms. All of the rabbis of yesteryear, the teachers, could have worked on PhD's, tested their psychological worldview, for they all had one. This is another, and it builds on the teachers of the past two thousand years. Good stuff for when you're bored on a Saturday. Nobody fuses psychology and religion better. Abraham Twerski and his work on addictions is the closest thing we've got. Peter writes in his latest work that he's taking off where the great twentieth century ground-breaker, Abraham Maslow stopped, with his Psychology of Needs, that pyramid of self-actualization. Beyond self-actualization there should be more, he suggests, a step that keeps us high, guilts us into perpetual self-actualization. 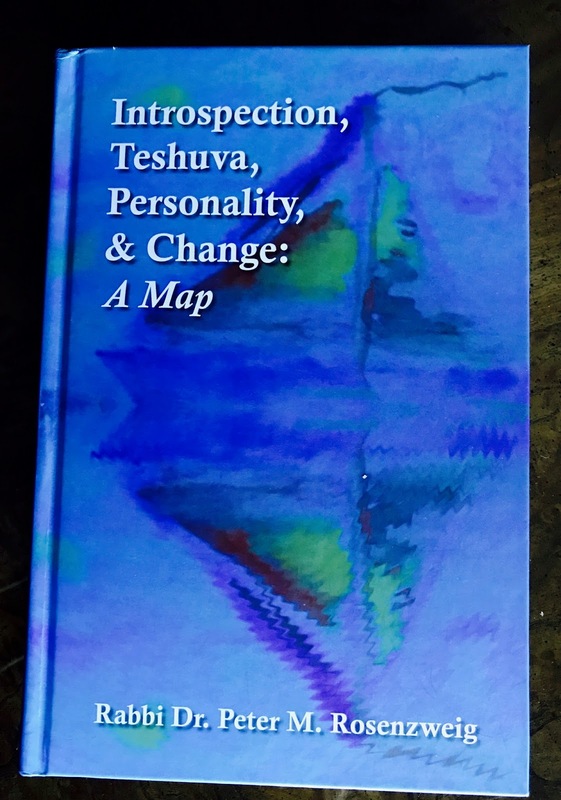 An alternative title to Introspection, Teshuvah, Personality and Change: A Map, could be, Where Maslow Left Off, but the book takes more from those earlier teachers than from the psychologist. 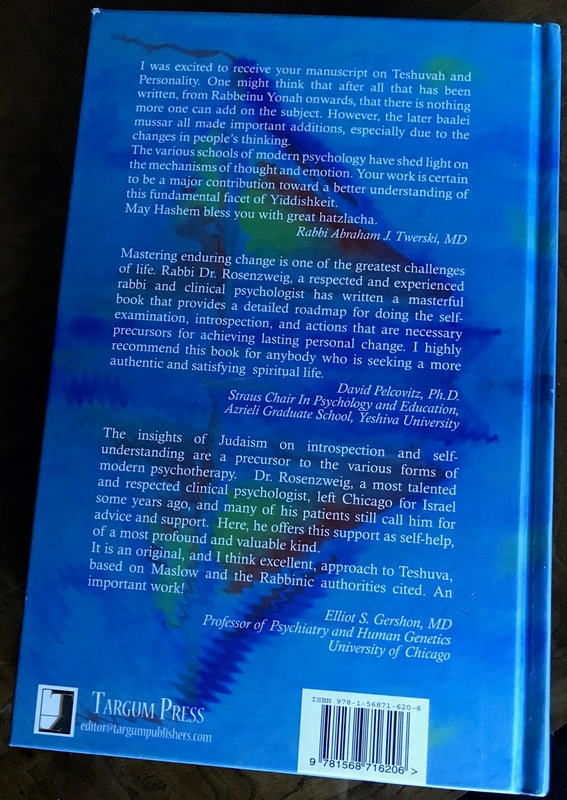 But the two go together, because to this rabbi-psychologist, developmental growth will depend upon us, our search for ourselves, and looking in the mirror. We're supposed to look ourselves squarely in the eye, grappling with our narcissism and neediness, our personalities, then transcend them. That's the purpose of life, and he might say it somewhere, I can't remember, but to me, that is tshuvah, the process of returning to wanting to be a better person, the best person we can be, something the Jewish people traditionally do beginning the month before the new year, then on Rosh Hashana, that New Year's holiday, all the way until Yom Kippor, the long night and day of fasting, no food or drink. And then it ends. Judged redeemable, renewed for another year, we tend to stop. Dr. Rosenzweig offers us a map, however, that keeps the process alive, which theoretically would raise our self-esteem (we're not so bad! we're working on ourselves!). In the map we find ourselves as one of a dozen personalities, and contemplate that. It is hard, especially if we find ourselves disordered in so many ways, a cluster of many personalities, all arguing amongst themselves within that largest organ of the human body, the skin. 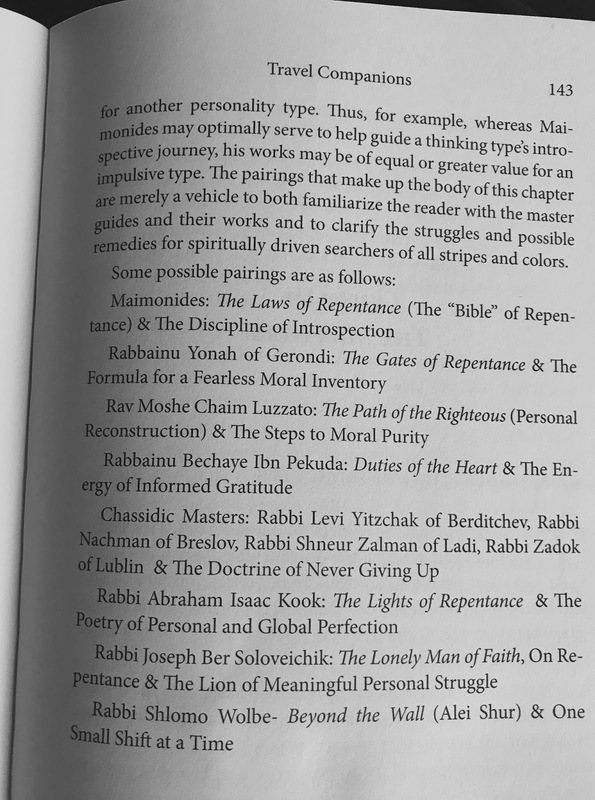 Like his other books, I just like the way the rabbi/psychologist fuses his religion with his psychology. He's clearly had some mindfulness training, and his share of experience with the most difficult of patients and personalities. Those of us who have a strong worldview that isn't taught in graduate school are always integrating what we learn with what we believe. Nobody does this better than Peter. One of the doctor/rabbi's favorite themes is a human condition we all share, yearning. When we carve out the time to introspect (recommended, the first turn on the map), tune out our worldly concerns, stop with obsessing about the future to concentrate upon the present and ourselves, we find yearning. It is a universal idea, but typical for Peter to hit on as the answer to so many things. 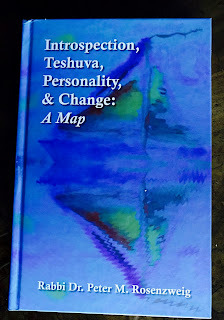 This is the beauty of Introspection, Teshuvah, Personality and Change: A Map, pointing out the obvious, breathing new life into it. Who isn't yearning for something? We all do. Within that matrix is a yearning for personal growth? The pathway to self-esteem, he suggests, is somewhere between mindfulness and purpose in this world, yearning for that, a best self with a purpose. Now that's something to meditate on. Our best self is the one that will make us happy. We see the obstacles to happiness, they are everywhere. We can project our troubles on others, on something other than ourselves. We don't introspect much anymore unless we meditate, because who has time? On whenever we worship, maybe then. Introspection, in this paradigm, isn't meditation, but with "the map" might be a ticket to self-esteem, continual self-actualization. And it isn't Quabala, either, Jewish mysticism. I haven't finished Transparent, but someone in that family, a modern, seeking entourage, talks about learning Quabala. Traditionally finding the sparks of creation requires more learning, learning the entire Torah and Talmud a few times over. But it's a nice thought. What is this path? Not much more than the baby steps your average therapydoc would recommend. To begin to get well, to begin to self-actualize, one must take a good look inside, find what is there, then become more than that. Maybe all it takes is offering to take out someone's trash, when you see them struggling with it in the alley. Or driving someone somewhere. Corny, right? But true. It won't be enough, not at all, but is a start. Those personalities of ours, these are the problems. Hence the need to introspect. Enlightenment begins with an honest look at our behavior. 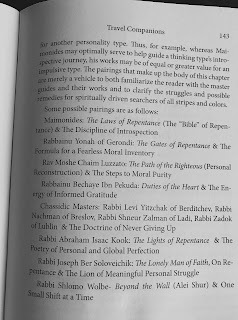 For people who haven't been raised knowing any Hebrew, a glossary might help Introspection, Teshuva, Personality and Change. Maybe next publication. But the important words are defined. Teshuvah, for example, is a sincere yearning to return to something better, to become a better person. It is a commitment to self-work. Tune out in order to tune in. Not your mother’s meditation or your father's Torah. People don't change. People do change. Like the lightbulb and the joke: How many psychologists does it take to change a lightbulb? Only one, but the lightbulb really, really has to want to change. This year, on Rosh Hashana, we do the work, look at our faults, consider how to change. Following Rabbi Dr. Rosenzweig's GPS might help, too.